It's that time of year: fresh grown strawberries are in season! And lucky for me, my mom just brought some over from her garden. Now my brain is racing to figure out what I should do with them. Should I make them into a pie or use them as a topping for shortcake? Both sound tempting, but there are all sorts of strawberry dishes to make, and many of them can be low in calories. Of course, lightly smashing them with a bit of artificial sweetener can make a delicious topping for angel food cake or non-fat frozen yogurt. But you can also try a savory dish by making a strawberry salsa and pairing it with salmon or grilled chicken. A strawberry spinach salad can make a wonderful side dish or stand as an entrée. How about strawberries for breakfast? Top your cereal with the juicy fruit for a hint of sweetness. Or mix it with low-fat yogurt and bit of granola for a crunch. And you're kids will love a strawberry smoothie for breakfast or an after school snack. When selecting strawberries, whether at the store or in the garden, pick bright red berries and leave the caps on. Removing the caps may tear the cells of the berries, activating ascorbic acid oxidase, an enzyme that destroys Vitamin C. Check for signs of mold growth. Even if just one berry is moldy, you should throw the whole thing out. Mold spores can have root threads and travel throughout the entire package of berries. When shopping for strawberries, or when picking them fresh out of the garden, make plans to use them soon. 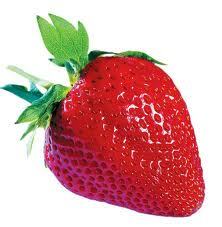 Strawberries generally only keep for 2-3 days. Store berries in a loosely covered container in the coldest part of the refrigerator. Like most fresh fruits, vegetables and herbs, it's best not to wash them until ready to use. Washing produce before storing may promote bacterial growth and speed up spoilage. If you don't plan to use the strawberries within a few days, consider freezing or drying them. For step by step directions, go to the National Center for Home Food Preservation. For starters, I'm planning on making this delicious breakfast shake in the morning... Of course, the way these strawberries are disappearing, I'm just hoping there will still be some left to make it! Blend banana with pineapple juice, yogurt and strawberries in a blender until smooth. Divide shake between 2 glasses. Strawberries are good for human body and they have lot of advantages . . i read this in nutrition articles which is really helpful !